Sergio Corbucci's snow-bound spaghetti western masterpiece doesn't have the household recognition of Leone's films, but it is a haunting and beautiful and affected me deeply. Ah, the Spaghetti Western. A genre that is somewhat western, often somewhat horror, usually painstakingly filmed and, when especially when scored by cinema LEGEND Ennio Morricone, serenely beautiful in an often off-putting way. 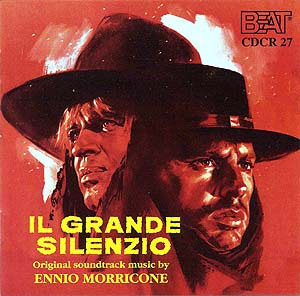 Now toss in dour as all hell and you’ve got Sergio Corbucci’s The Great Silence, or Il Grande Silenzio, as the film is known in its native Italian. First – spoilers will commence after the image of the DVD I am posting below. Just saying. The basic plot of the film is nothing groundbreaking; it’s a text book Spaghetti western number that, interestingly enough, garners influence from – according to the Wikipedia entry – Mario Bava’s Black Sabbath and Andre De Toth’s Day of the Outlaw. I’ve not seen either of those films, but of course they are on my list. In a nutshell, Silence is based on real events – the fact that during the days of the old west, as law and order were being hewn into the raw rock and mortar of the cruel landscape of the west, Bounty Hunters were finding they could make a pretty good living out of murdering for money. If there is a theme that runs through and shapes this film, it is that. One of the penultimate lines in the film, spoken by main bad guy and bounty killer Loco – BRILLIANTLY played by Klaus Kinski (yes, that Klaus Kinski) – is “According to the law” in reference to not only his cold-blooded murder of the protagonist – the Great Silence himself, a badass, super-quick-draw nomad who cannot speak due to having had his throat cut at an early point in his life – but also a saloon full of people. This is a chilling way to end the film, and although there is an alternate, “happy” ending on the special features menu I had no interest in viewing it because after the epic, sweeping feeling of the film and its culmination in such a dire, downer way, the idea of an alternate ending seemed something dangerously capable of quelling the disturbing afterglow the film left me with. Kinski is magnificent – as he always is – in the slimy, hatred-soaked role of Loco. Actually, hatred is the wrong word. Loco does the terrible things Loco does motivated by, as he says just before killing another key character in the film, not by the Law, but by the Law of Survival. Backed by a pack of blood thirsty bounty killers for the climax Kinski literally emanates this sentiment through every movement, every gesticulation and every gaze – his self-serving, money-over-everything aesthetic seeps from his retinas on camera and becomes an almost palpable force, like Magneto’s Power of Magnetic Manipulation or Wolverine’s claws. Murder-for-gain is the man’s superpower and he uses it to win. This makes the film and also, perhaps strangely, provides the final chiseling of Silence himself (played by the wonderfully understated Jean-Louis Trintignant), a sympathetic and boldly heroic character who ends up terribly frail and tragic being that, in one of the very few occasions in cinema, he is simply not heroic enough to win or live to see the outcome of the film. At some point Silence goes from self-assured and badass to almost childlike as his injuries mount and the widow who has hired him to avenge her husband’s murder (by Loco of course) turns first into his lover and then into an almost mothering figure. The progression of this character from iconic good guy to wounded child is amazing, made doubly powerful by the fact that he is able to muster the gumption for a last stand and it fails. Like many Spaghetti westerns the story of The Great Silence is enhanced tenfold by not only amazing cinematography by Silvano Ippoliti (did I mention this is one of the maybe two westerns to be shot in snow*? The film takes place during the during the harsh winter 0f 1899 in Snowhill, Utah) but also by an unbelievable score by Ennio Morricone which accents the bleak wintery landscape in ways almost too synesthetic to put into words. There are entire scenes shot where a simple wagon or horse meanders through the snow-drenched plains and Morricone’s music becomes something akin to the wind – a lilting, ancient and merciless entity that wafts along, carrying the viewer to an unknown end and gathering events in its wake. It’s hard to make clear the beauty that viewing this film generates but if you view the following clip you may begin to understand just how grand this work of art is. Not grand, Magnificent. Yeah, Magnificent is the word.